For the concept of kingship in Greek, see Wanax and Basileus. For the kings of various polities in ancient Greece, see their articles. For the kings or emperors of the Eastern Roman Empire, see list of Byzantine emperors. 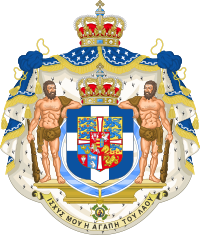 The Royal coat of arms of Greece under the Glücksburg dynasty, created after the restoration of King George II to the throne in 1935, to the exile of King Constantine II in 1967 and finally until the abolition of the monarchy in 1973. Only the first king, Otto, was actually styled King of Greece (Greek: Βασιλεὺς τῆς Ἑλλάδος). His successor, George I, was styled King of the Hellenes (Βασιλεὺς τῶν Ἑλλήνων), as were all other modern monarchs. A republic was briefly established from 1924 to 1935. The restored monarchy was abolished following a referendum in 1973 conducted under the auspices of the then-ruling military regime. Its finding was confirmed by a second referendum in 1974, after the restoration of democratic rule. The convention offered the throne to the Bavarian Prince, Otto. They also established the line of succession which would pass the crown to Otto's descendants, or his younger brothers should he have no issue. It was also decided that in no case would there be a personal union of the crowns of Greece and Bavaria. In October 1862, King Otto was deposed in a popular revolt, but while the Greek people rejected Otto, they did not seem averse to the concept of monarchy per se. Many Greeks, seeking closer ties to the pre-eminent world power, the United Kingdom, rallied around the idea that Prince Alfred, the second son of Queen Victoria and Prince Albert, could become the next King. British Foreign Secretary Lord Palmerston believed that the Greeks were "panting for increase in territory", hoping that the election of Alfred as King would also result in the incorporation of the Ionian Islands, which were then a British protectorate, into an enlarged Greek state. The cleavage in society extended to cultural and social issues such as differences over the use of Greek language to architectural styles. To this polarization was added the destabilizing involvement of the military in politics which resulted in several coups and attempted coups. The economy was in ruins following a decade of warfare and was unable to support the 1.5 million refugees from the population exchange with Turkey. Despite the efforts of the reformist government of Eleftherios Venizelos in 1928–1932, the Great Depression had disastrous impact on Greece's economy. The electoral victory of the People's Party in 1933, and two failed Venizelist coups, paved the way to the restoration of the reign of King George II. In 1935, Prime Minister Georgios Kondylis, a former pro-Venizelos military officer, became the most powerful political figure in Greece. He compelled Panagis Tsaldaris to resign as Prime Minister and took over the government, suspending many constitutional provisions in the process. Kondylis, who had now joined the Conservatives, decided to hold a referendum in order to re-establish the monarchy, despite the fact that he used to be a supporter of the anti-monarchist wing of Greek politics. Wikimedia Commons has media related to Monarchs of Greece. ^ Protocol signed in 1832 but landed in Greece on 6 February 1833. ^ Dates are in the New Style Gregorian calendar. The Old Style Julian calendar was used in Greece till Alexander's lifetime. ^ For more information, see this page. This page was last edited on 28 November 2018, at 12:57 (UTC).